Long Kang Lam Nam Mae Teung (Aumper Aom koi - S Ngao) started sailing at Ban Hauy Nam Kao , Aumper Aom Koi ,Chiang Mai. Pass the forest of wildlife sanctuary. Have a camp along the river. 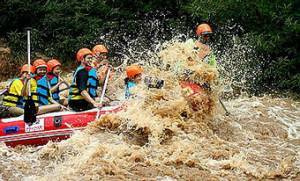 Take the time to try 2 night 3 days / 2 to 3 rapids at 4,500 baht / person (over 10) can take months from October to February. For more information contact the House Call Number Four.